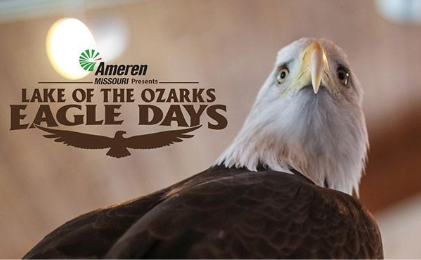 Ameren Missouri's Lake of the Ozarks Eagle Days returned for its 18th year at the Lake of the Ozarks in early January. The first live eagle program was held in 1999 and attracted 651 participants. Nearly 4,000 people attended the 2019 event. A collective partnership with the Lake Area Chamber of Commerce and area organizations and businesses hosted this entertaining and educational event. Highlights of the program included live eagles from the World Bird Sanctuary with naturalists on hand to answer questions at Osage National Golf Resort. Hourly programs were held each day of the event. Visitors were urged to bring binoculars and cameras for optimal viewing and photo opportunities of wild eagles at Willmore Lodge and below the Bagnell Dam on the Osage River. Activities were also held at School of the Osage Heritage Elementary and at the Osage River Access. At School of the Osage Heritage Elementary, two programs were given by Dickerson Park Zoo. The first was the American Bald Eagle Program. The second program was the Day Shift (Hawk), Night Shift (Owl) and Garbage Gal (Turkey Vulture) Program. School of the Osage Heritage Elementary also had activities for kids, coloring contests, and vendors.